Will candidates running for office in Vermont this fall face any limitations on how much money they can raise? In an opinion released earlier this week, Attorney General Bill Sorrell said yes — even though the Senate failed to correct an error in state law that appears to set no fundraising caps until 2015. Sorrell argued that the legislature clearly intended to keep older limits in place, and legislative intent matters. But Sen. Peter Galbraith (D-Windham), an outspoken proponent of campaign finance reform, says Sorrell got it wrong. He claims Senate leaders consciously chose not to fix the error, because they were afraid Galbraith would force an uncomfortable debate over the law. Therefore, he argues, Vermont currently has no campaign contribution caps. "Leadership decided it preferred no limits to a bill with meaningful limits," Galbraith says. "The AG cannot now interpret leadership's preference for no limits on contributions as meaning the repealed limits remain in place." The problem first arose in January, when the legislature passed and Gov. 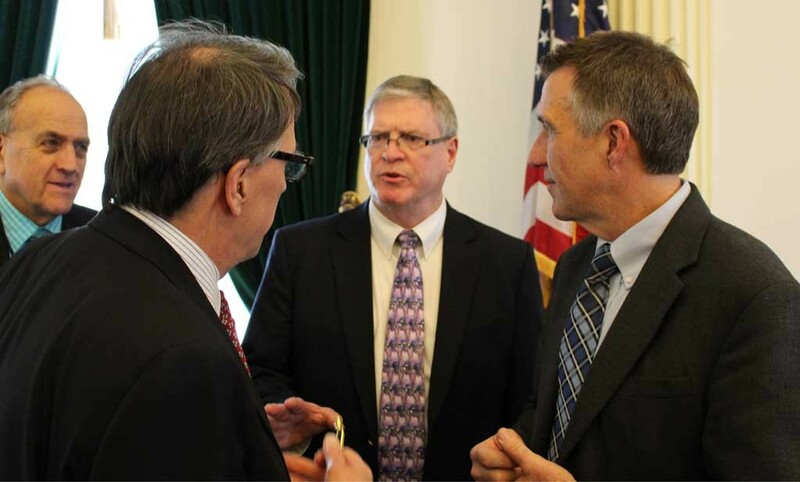 Peter Shumlin signed into law new campaign fundraising rules set to take effect in January 2015. But due to a drafting error made by a legislative attorney, lawmakers inadvertently repealed the state's existing contribution limits. Asked at the time whether that meant Vermont had no fundraising caps, Secretary of State Jim Condos said, "I guess you could say that... I assume they're going to take care of that." The Vermont House did. Within a week, the House passed legislation restoring the old rules until 2015. But the Senate didn't follow suit. The fix passed the Senate Government Operations Committee in February, but then it languished in the Senate Finance Committee until the legislature adjourned last weekend. According to Galbraith, "This was an intentional decision by leadership and had nothing to do with lack of time." He says Senate leaders were concerned he would amend the new bill to set stricter limits on how much money political parties could raise from individuals and how much parties could then contribute to candidates. Galbraith said he also intended to prevent wealthy individuals from evading limits by contributing through multiple companies under their control. So why didn't Senate Finance advance the bill? "The short story is I wasn't asked to bring it up, so I didn't bring it up," says the committee's chairman, Sen. Tim Ashe (D/P-Chittenden). "I can't speak to the motivation, though I wouldn't be surprised if [leadership was] worried about another floor debate about corporate and union contributions." Ashe says he agrees with Galbraith that lawmakers' lack of action speaks volumes. "I actually think that legislators were aware that they had made an error, and between the House and the Senate, they didn't correct it," he says. "So I guess I've reached a different conclusion than the attorney general." Senate President Pro Tem John Campbell (D-Windsor) admits he killed the bill that would have restored the old limits, explaining that he did not want to spend valuable time re-litigating campaign finance reform — a topic that bogged down the Senate for years. "Sen. Galbraith made it clear that he was going to make it a big issue and come up with all sorts of amendments," Campbell says. "He was looking for a stump to make political statements. Listen, I like Peter personally, but the Senate's not here as a vehicle to make political statements. You know, we had important business to do for Vermonters." Campbell does not, however, agree with Galbraith's and Ashe's take on where that leaves Vermont's campaign finance regimen. Before allowing the fix to die, he says, he consulted with legislative attorneys and Sorrell's office. They assured him that a new bill was not necessary, he says. Much of the political establishment appears to be lining up behind the attorney general. Shumlin spokeswoman Sue Allen says that while the AG is best suited to offer a legal opinion, "the governor plans to abide by the old campaign finance limits." And Condos now says that when he agreed in February that Vermont has no contribution caps, he "may have misspoken at the time." "Since that time, I've had conversations with the attorney general and believe, like they do, that legislative intent is that the current campaign contribution limits remain in effect for this cycle," Condos says. For his part, Sorrell says he has "a strong argument" that Vermont's old law stands. "Courts will typically find that, unless the legislature intends for there to be no rules during a given period of time, courts will go beyond the clear wording of a statute to try to discern legislative intent," Sorrell says. To determine legislative intent, Sorrell's office listened to and transcribed recordings of committee meetings during which the bill was debated. "The discussion wasn't whether there should be no limits during the rest of the current cycle," he says. "There was no sentiment that, 'Oh, well, let's let it be the wild west for the remainder of the cycle.'" In his formal opinion, which he issued to Condos' office Tuesday, Sorrell further argued that the Senate's decision not to fix the error doesn't matter, because, he wrote, "inaction cannot be the basis for inferring legislative intent." Whether any candidates will challenge Sorrell on the matter remains to be seen. Republican political consultant Darcie Johnston, who helped run 2012 Republican gubernatorial candidate Randy Brock's campaign, told Vermont Public Radio this week that she "would not want to have to defend our attorney general's position." And Charlotte attorney Brady Toensing, who serves as vice chairman of the Vermont Republican Party, says the mistake represents "manifest arrogance and incompetence." "Don't these Democratic legislators read the laws they write and vote for?" he asks. "Or do they need to pass the laws first to know what is in them?" "Now, the state is forced to patch together a legal argument drawing upon legislative history to try to shore up this error. It is not just embarrassing. It also creates a difficult enforcement situation," Toensing says. "In the end, a Vermont court would likely agree that the old limits apply and order any [excess contributions] to be returned. But due to the ambiguity caused by the error and intent requirements, the attorney general would be hard-pressed to be able to get significant penalties, if any, out of any alleged violators."